I guess Council 24 of the American Federation of State, County, and Municipal Employees thought all they had to do was lean on the little lady and she’d fold like a house of cards. But Ms. Dawn Bobo, 54 years old and the owner of the Village Dollar Store in Union Grove Wisconsin, decided she wasn’t letting phony for-the-people thuggery get in the way of operating her business. A few weeks back, five union representatives showed up at Dawn’s little shop to ask her to hang a pro-union sign in her store window. When she explained that hanging pro-public employee union signage in her shop would alienate at least half of her clientele, the union boys politely smiled and went their merry way. But then the follow-up letter from Council 24’s Field Representative, James Parrett, arrived stating that Ms. Bobo better change her mind or risk an organized boycott of her business. Mr. Parrett also declared that any business owner who tried to remain neutral would be considered anti-union and targeted for intimidation as well. The spunky Ms. Bobo, however, was having none of it. 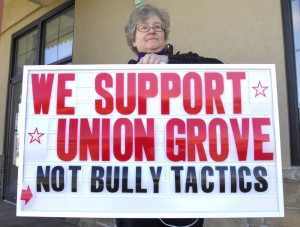 After notifying the local sheriff and her Senator of the union’s threats, she took the union bully boys by the horns and created her own sign which she proudly hung in her storefront window. Her gutsy response to those gangster goons garnered the attention of the local and national media. And that attention turned out to be very very good for business. It seems a whole lot of folks are driving clear out of their way to visit the Village Dollar store in Union Grove to do a little solidarity shopping. Well, now the AFSCME union leaders are backpedaling from the boycott threat as fast as their big clumsy feet can manage. The union could find itself in court charged with a whole range of crimes starting with extortion, so out came the disclaimer from the Executive Director of Council 24, Marty Bell. Oh, dear! Mustn’t let the masses see those behind-the-scenes scenarios that go on all over the country all the time. Intimidation?? From us noble union lads and lassies?? Now why would anyone think such ill deeds of the public employee enforcer squad? Here’s Fox News’ take on the Chronicles of Mafia and their Dawn Treader tryst. This entry was posted in Political/Social and tagged AFSCME, Dawn Bobo, James Parrett, Marty Bell, public employee unions, sign, Union Grove, Wisconsin. Bookmark the permalink.